The heroes of Tyria didn't fare too well at the end of Guild Wars 2's most recent Living World chapter. What happens next? Shacknews finds out by going hands-on with the PvE portion of Guild Wars 2: Heart of Thorns for the first time. The heroes of Tyria ventured into the depth of Maguuma's treacherous jungle with the goal of finally vanquishing the elder dragon Modremoth, once and for all. An entire fleet of brave warriors was ready to breach into the unknown, only to see their mission fail miserably in the blink of an eye. In an unexpected turn of events, the very jungle itself sprang to life and demolished the fleet, leaving destruction raining down upon the land. This is where the next part of the Guild Wars 2 story begins. To learn what players can expect next, Shacknews briefly went hands-on with the upcoming Heart of Thorns expansion. In addition to witnessing the foundation of the new PvE narrative, this also provided a unique opportunity to try out the new Revenant class for the first time. Just the look of the Revenant alone sets it apart from other professions in the Guild Wars 2 world. Donned in ceremonial armor, the Revenant's power leaves him or her blind to the world around them. That's why the Revenant dons a ceremonial blindfold that sports a different appearance depending on the details of your personal story. The Revenant wields distinct weaponry to match his unique look. The main weapon of choice is a massive hammer, which is mostly used for attacking from a distance. The Revenant can toss the hammer and have it boomerang back their way, while he can also pound the ground to create a makeshift bridge that'll both weaken foes and buff allies. A mace can also be used for melee-based attacks, as long as it catches anything in its path, but it should be noted that a Revenant can only equip a single weapon and is unable to swap while in-game. The Revenant's main appeal, however, is the ability to switch skills back-and-forth by channeling the great Tyrian heroes using the F1 key. Attacks bound to the 6 through 0 keys will change, based on the hero stance selected. For this demo, the Revenant could channel the great dwarf king Jalis Ironhammer, which would add area-of-effect hammer-based attacks. Among the abilities available is an elite attack that would turn him and all surrounding allies into stone to increased durability and prevent knockback. The other option was to channel the demonic Mallyx the Unyielding, who would devastate multiple foes with shadow-based attacks, such as one that allows the Revenant to leap directly at enemies for a powerful strike that knocks them back and another that turns him into a powerful demon that ups all his attributes. The Revenant's stance-switching ability makes it quite the novelty class and should be a fun one to learn, especially as more hero stances are added. 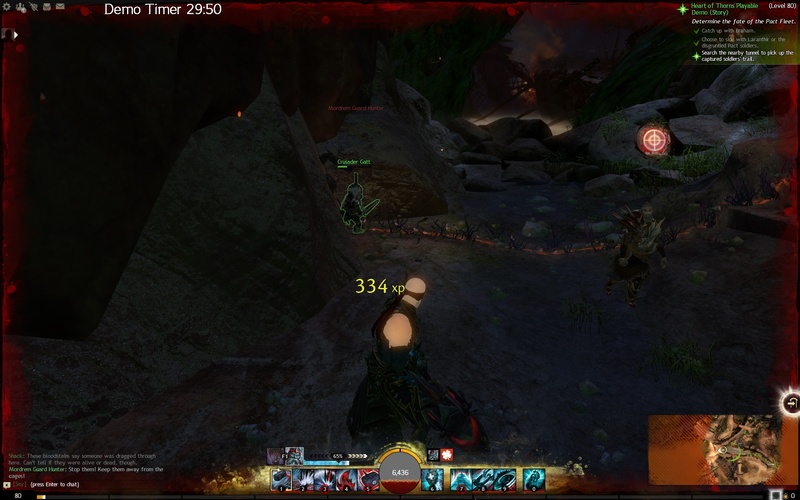 Keeping track of the attacks and how effective they are in battle takes some getting used to, but it's definitely something that Guild Wars 2 players should try out. As mentioned, this is the next chapter of the Guild Wars 2 story. The first part of the demo dealt with the fallout of the disaster that met the heroes upon entering the jungle. The priority was to find survivors, so the first story mission centered around entering the heart of the jungle for the first time to find any lingering heroes before they could be corrupted by the jungle's forces. Combat here was standard Guild Wars 2 fare, with enemies marching in and attacking on sight. However, the enemies on display were noticeably tougher to take down. Modrem Guards, for example, would hit with powerful area-of-effect attacks, while the area boss would summon plant-based minions that would latch onto your character, making them a pain to take down. Modrem Breecher vines would surface from the ground and attack out of nowhere, often spewing down molten rocks. 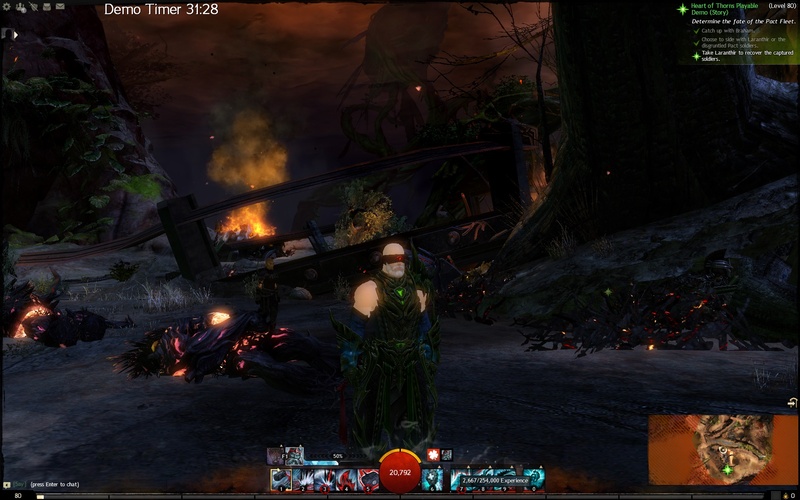 Simply standing and attacking was not an option, helping further refine the active movement required in Guild Wars 2. There are about five or six skills in each of these categories and they'll all make life in the jungle easier in their own unique way. For example, Mushroom Lore allows players to use the bouncy mushrooms strewn throughout the land to get to higher places. Exalted Lore offers combat advantages against some of the creatures you'll come across. And Itzel and Nuhoch Lore will enable communication with the foreign NPCs that lurk the jungle. Placing an emphasis on Mastery ensures that both Guild Wars 2 beginners and level 80 characters can have the same goal to work towards, which takes care of some of the balance issues that often come along with these types of expansions. While refined combat is fine, there's more to Heart of Thorns than that. The major addition to the combat is an added sense of verticality. While that wasn't so much evident in the story-based mission I tried, it was quickly displayed in a dynamic event mission that was unfolding once I came back from the story instance. A giant wyvern had attacked and the other players in the server were ganging up to take it out. After weakening the creature to a certain degree, it took to the skies. Players, including myself, then rushed to catch up to the wyvern by teleporting to its skyward location. The wyvern's attack patterns would involve raining down fire upon players and using its wings to blow them backwards. While some would get knocked down, others would get blown off of the skyward platform entirely. Those that were sent off the platform would have to deploy their hang gliders and float down to safety before regrouping and jumping across platforms to rejoin the fight. The ideal situation was to avoid being knocked off the platform, so Revenants like myself were frantically buffing allies to prevent the knockback condition. Guild Wars 2 dynamic events always involved a degree of teamwork, but this one looked to demand more of it than before. Verticality promises to be a major feature of Heart of Thorns, made more evident by some of the aforementioned Mastery skills. The wyvern fight looks to be the first of many of these types of boss battles that will ask players to utilize some of the best platforming prowess, as well as their standard character attacks and abilities. 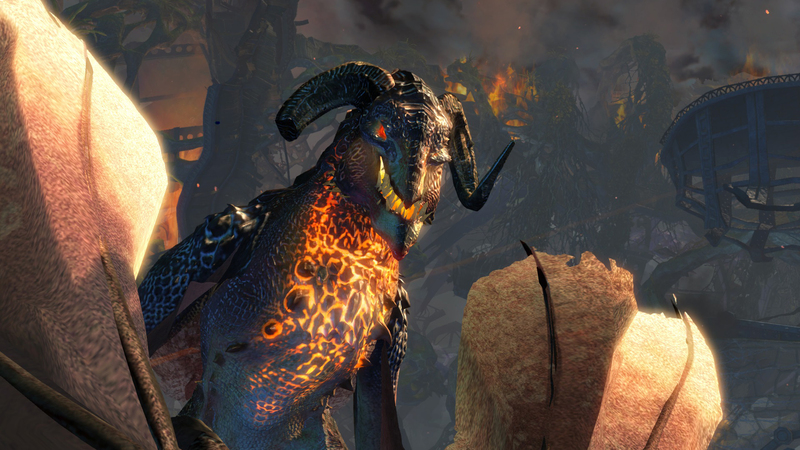 Guild Wars 2: Heart of Thorns is coming soon to PC. Those attending PAX East this weekend or EGX Rezzed in the coming weeks will get their chance to go hands-on with the expansion for the first time. This Guild Wars 2: Heart of Thorns preview was based on a pre-release PC demo of the game at an event where transportation and accommodations were provided by ArenaNet. Anyone still playing this? What's different about the game from immediate launch?